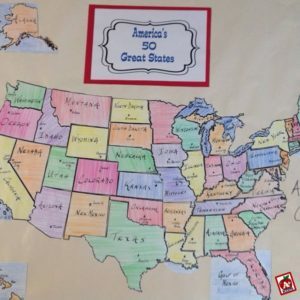 Just have to share my new resources about America's 50 states. There are five different resources rolled into one big bundle. Kids will learn about the states of our great country. They will become familiar with the map of the United States, develop a sense of spatial awareness of regions of the United States, identify states by their shape when presented outside of a US map, learn the state capitals, and use organizers to complete a state report. The five separate resources, all included in the bundle, and described below, are also offered individually. 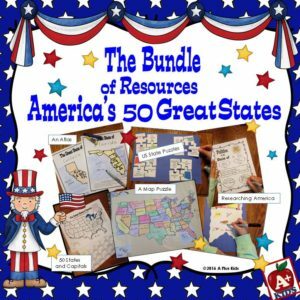 The bundle contains everything you need to teach a unit about America's 50 states including diversified approaches to the subject matter with ideas for differentiation. All 50 states, with their capitals clearly labeled, are depicted on individual pages. Students use classroom wall maps or the internet to find other large cities and large bodies of water for each state and label their own maps. The teacher must choose the objectives to be achieved: 1) use these pages to form one class atlas or individual ones for each student, 2) complete pages for individual states to include in state reports. Each of the 50 large puzzle pieces need to be identified, labeled and placed onto a large piece of paper to for a wall-sized (20" x 30") map of the US. 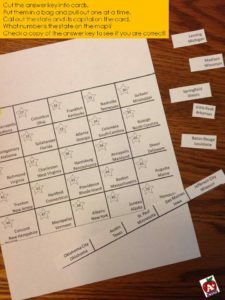 This is an activity that will work well working in small groups. 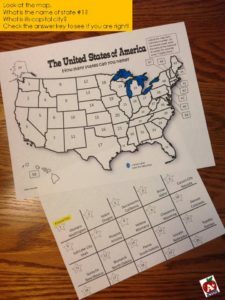 Kids can look at the shape of the states given to their group and try to identify them. The teacher can differentiate by giving more able learners states like Missouri and Ohio that can easily be confused with a few other states when they are no longer part of the whole map. Less able learners can contribute by working on states such as Texas, Florida, California and New York. They are easily identifiable. 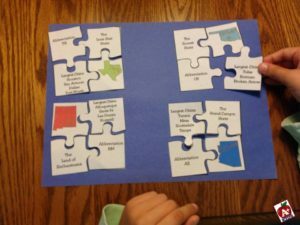 Kids assemble 50 four-piece puzzles using the clues on each puzzle piece. Clues include a picture of the state, large cities, the state's nickname and its abbreviation. Pictures of the states are presented in color. There is an additional set presented in black and white. A map of the United States has the states labeled only with numbers. 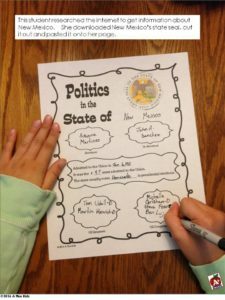 Kids identify each state and its capital city on the student's response sheet. 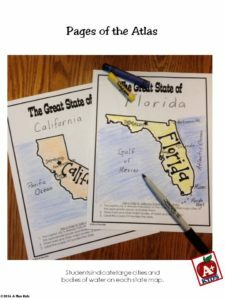 Teachers can also implement a reverse activity and make cards with the names of states and their capitals by cutting up the answer sheet. The cards are placed in a bag and pulled out one at a time. The card is read aloud. Kids need to find the number of the state on the map. This page is for general information about the state. Kids will need to use the internet to find out who holds office in the state they are researching. 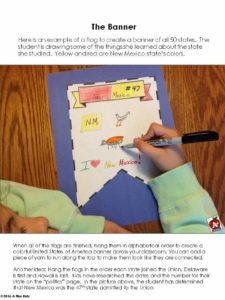 When research work is completed, kids can design a flag with information they have learned. This student is drawing a picture of New Mexico's state bug. 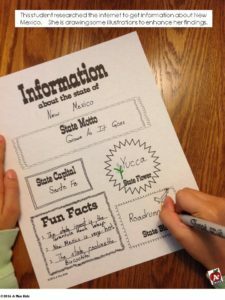 She also learned that New Mexico was the 47th state admitted to the Union. When she finishers her flag, it will be posted on the wall with others to create a long banner of states. When I was making these resources, I intended for them to enrich your class studies of America's states. Now that the entire bundle is completed, I realize that they can also used independently in your classroom to develop a particular skill or you can choose to use any combination of activities to suit your needs. My hope is that these resources will help you to save time and have less stress. Everything is done for you with the exception of some cutting and the students do most of that! Less work for the teacher, more fun for the kids and greater organization for everyone! Posted in Uncategorized on August 19, 2016 by Kathleen. 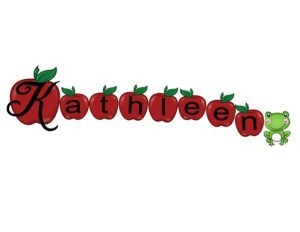 Subscribe to A+ Kids Bloggin'! 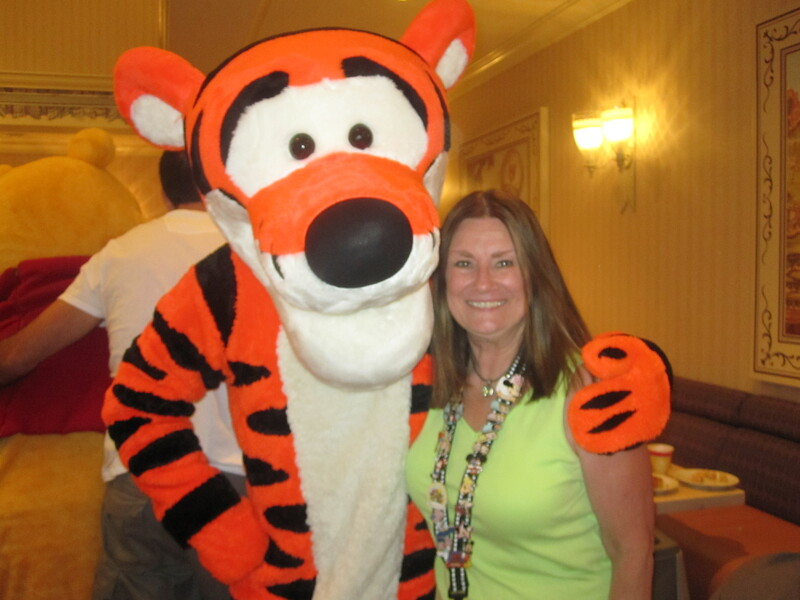 I was a guest blogger on Minds in Bloom. I was featured on Elementary School Blogs.